I have turned them into candles rather then tealight holders!!!! Firstly you need to gather all your materials! 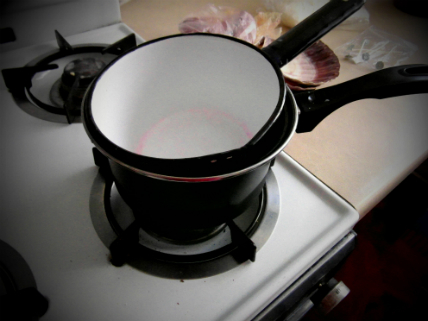 Fill the bigger saucepan a quarter full with water and place the smaller pan inside, now heat the water slowly. If the small pan moves about or doesn’t fit snugly just put a ramekin (or such like) into the bottom of the larger pan, giving the smaller pan something to rest on. 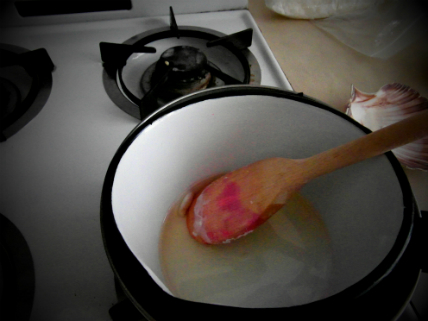 While the water heats up, you can pour some of the wax into the smaller pan. I tend not to use exact measurements; I use my own judgement. Remember what looks like a lot of wax won’t be once melted, plus the shells (particularly scallop shells) won’t need much filling due to them being curved, they will over fill quickly and then spill molten wax everywhere. 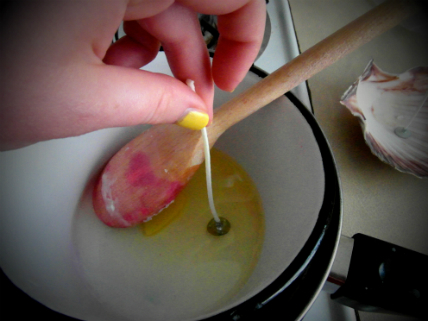 At this stage, the wax is melted so this is when you need to add the colour and/or fragrance. 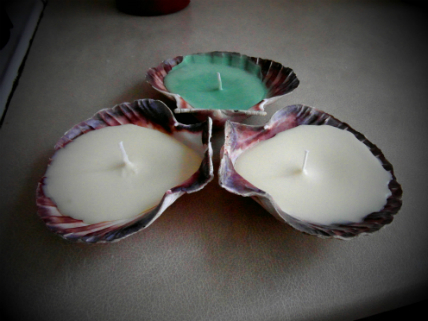 I added some yellow wax from an old candle for 2 shells and used green wax for the other; I also added a couple of drops of Garden Lily candle fragance. I have used aromatic oils before but found that water based ones tend to stop the wax from sticking to the shell, so it’s really trial and error on which oil works best. 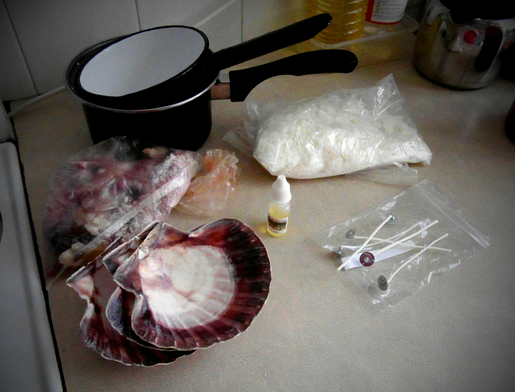 You can also use the melted wax as glue to stick the wick to the shells. 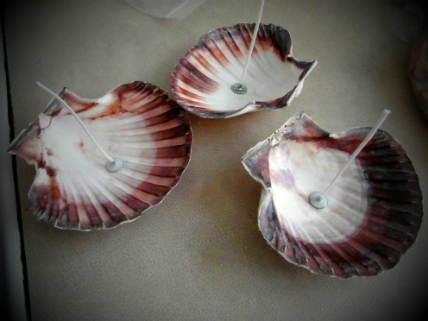 Dip the wick into the wax and stick it to the shell as close to the middle as possible. If you don’t have pre-waxed wicks you need to submerse the whole wick into the melted wax then push it into the shell until it sticks. 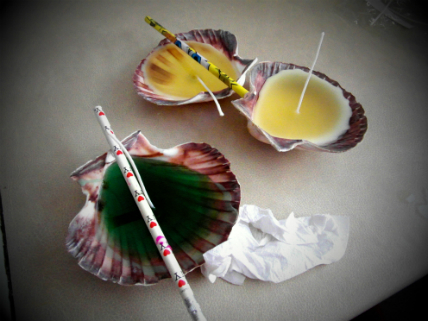 Now carefully pour the wax into your chosen shell and, with the pencils, prop up the wick as they tend to wilt slightly. Once the wax has fully set, cut the wick and enjoy the glow! I made 3 candles and, because I used 2 different colours, I used toilet roll to wipe the residue leftover from the yellow wax. But you don’t have to do this. Also you may want to make sure your shells are stable. Mine were not, as I found out when pouring in the wax and the shell moved. You’ll see on the green candle some wax has dried on the shell round the edges. Thankfully I like the rustic look but for those that don’t, stick those shells down. For those that treasure their kitchen you may want to put something down to catch any spilt wax. I didn’t and had to scrape it off with a knife. Oopsy! However after all the little mishaps and after a cut toe (don’t make candles and lunch all at the same time! ), I’m rather pleased with the result. These little shell candles will also look really pretty glistening away during the midsummer nights, and by adding some citronella you’ll keep those pesky mosquitoes at bay. 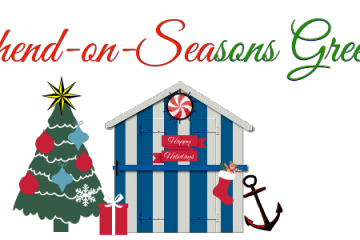 Enjoy lighting up your shells!